If there is one salad that should be a staple in your refrigerator every week, it is definitely this one. Chickpeas, also known as garbanzo beans, are a good source of protein and fiber. This is an ideal dish to bring to any picnic or cook-out since the chickpeas make a great meat alternative for any vegetarian guests. Dressed with olive oil instead of mayonnaise this salad can hold up for a few hours without requiring refrigeration. 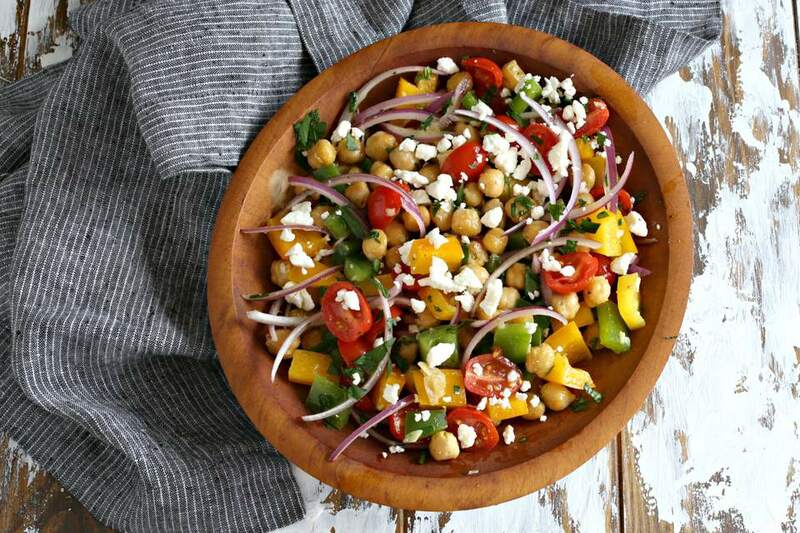 Because chickpeas are a staple in Mediterranean cuisine, as well as Middle Eastern and Indian, they're a natural to pair up with fresh vegetables and a Mediterranean-inspired dressing. Fresh tomatoes, garlic, crumbly feta cheese, oregano, and good extra virgin olive oil make this salad's flavors bright and delectable. If bell peppers are not your thing, feel free to add whatever other vegetables you like, such as crunchy carrots, cucumbers, broccoli florets or sliced radishes. You can even include a cooked grain such as quinoa or farro to make the salad more of a substantial meal. Make a big batch at the start of the week and keep it in a sealed container in the fridge for easy and nutritious lunches. Or portion it out into mason jars for an easy grab and go meal on the run. Rinse and thoroughly drain the chickpeas. Add to a large skillet or cast iron pan along with the tablespoon of olive oil. Saute on medium high heat, stirring often, for about 5 minutes until the chickpeas are slightly crisped. Make the dressing by whisking together the minced garlic, extra virgin olive oil, fresh lemon juice, mustard, dried oregano, salt, and pepper in a serving bowl. Add the chickpeas, cherry tomatoes, sliced red onions, diced orange and yellow bell peppers and parsley to the bowl and toss. Top with the crumbled feta cheese and serve at room temperature.